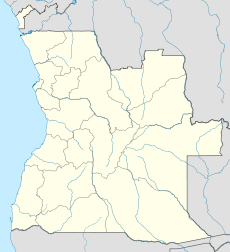 Negage Airport (IATA: GXG, ICAO: FNNG) is an airport serving Negage, is a town and municipality in Uíge Province in Angola. It is was formerly a Portuguese military airbase. The airport resides at an elevation of 4,105 feet (1,251 m) above mean sea level. It has one runway designated 16/34 with an asphalt surface measuring 2,400 by 30 metres (7,874 × 98 ft).